Taylor Culbertson began work with Copperhead Environmental Consulting, Inc. in spring 2013 as a technician and became a full time employee at the start of 2016. Mr. Culbertson received his B.S. in Wildlife Management from Eastern Kentucky University in 2012 and immediately fell in love with field work. He has gained experience through surveys involving a wide variety of taxa including bats, macro invertebrates, plants, and terrestrial gastropods. Taylor has extensive experience with endangered eastern bat species including the Indiana, northern long-eared and gray bats. He also has been heavily involved in mist-netting, harp trapping, acoustic monitoring, habitat assessments, exit counts, cave surveys, radio-tagging and radio-telemetry of these species and more. 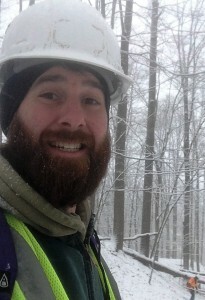 Mr. Culbertson has also had the opportunity to conduct aerial telemetry surveys during several field projects and holds a Kentucky certified pesticide applicator permit which allows him to lead teams conducting timber stand improvement (TSI) projects. In his free time Mr. Culbertson’s enjoys camping, hiking, insect collecting and pinning, herping, and motorcycling.